Morgan Stanley is to buy the Goldfish credit card business from Lloyds TSB in a £1bn ($1.76bn) deal. The payment includes £800m for Goldfish customer balances and a £175m premium for the business for Lloyds. Lloyds added it would net a pre-tax profit of £70m from the sale, which was in line with its plans to focus on its own-brand credit card business. Morgan Stanley will add about 800,000 accounts to its existing 1.5 million UK credit card accounts with the move. The US group added the acquisition was a "great fit" and would complement its current operations. "The acquisition will give Morgan Stanley the opportunity to invest in the Goldfish brand and strengthen its foothold in the credit card market," said the head of its UK credit card business, Charlotte Hogg. The deal also includes Goldfish's Glasgow operations centre, with about 300 staff and premises. Most of the staff will transfer to Morgan Stanley. "Having reviewed our credit card business, I am convinced that our strategy going forward should focus on growing our core franchise," said Terri Dial, group executive director of UK retail banking at Lloyds. "The sale of Goldfish reflects our desire to concentrate on growing our Lloyds TSB branded credit card business. "As customers increasingly use credit and debit cards as tools to help them manage their cash flow, we believe there are substantial growth opportunities." 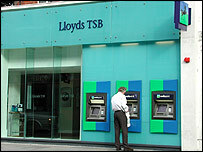 Lloyds bought up the 70% stake it did not own in Goldfish from British Gas-owner Centrica in 2003. The deal is expected to be completed in February.